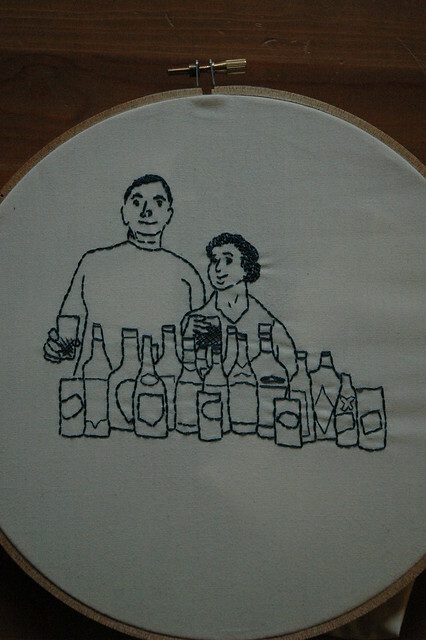 I’ve been working the last few days on this little piece (it’s less than 7″ wide) featuring my paternal grandparents. There are some parts that I am really happy with — my grandfathers’ hair and hand — and other parts that I wish were better. I don’t normally do things twice, but I am thinking I might be more satisfied if I go a bit bigger. Eventually, I can see myself collecting all my little family-based pieces into something bigger. Still not sure what exactly, but something. 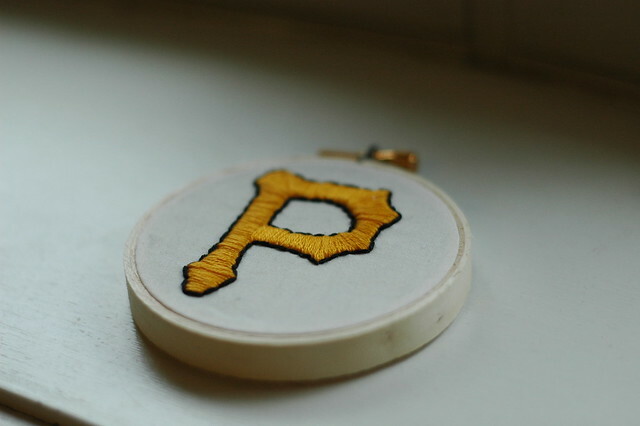 Next, I made another little 3 incher for my husband, the Pittsburgh sports fan. 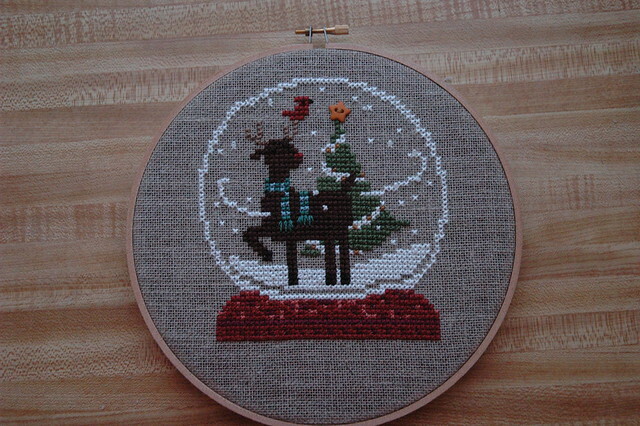 And finally, this cross stitched reindeer in a snow globe. My daughter picked out this pattern at my local shop. I made a few mistakes along the way (cross stitch and I are getting along better these days, but it’s still not my favorite), but I think it turned out fine. I’m sure I’m the only one who will know/notice the problems. I made some other things, too but not all have been given (and not all have been properly photographed, a problem I seem to have often). I love making things for other folks, but I also can’t wait to get back to making things for me! I read a lot of things here on the internet. I have over 140 blogs currently in my feed reader (and another 40 or so that I read on occasion). So, it is not unusual for me to read something that I disagree with. It is, however, unusual for me to read something (especially a crafty something) that gets me really fired up. * But it happened the other day. I let myself get mad, wrote a long email to myself ranting and stating my case. And then I made this (warning: curse word ahead, click to continue…). 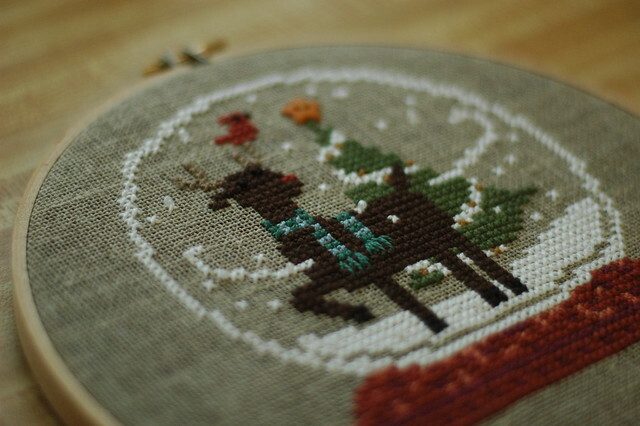 As soon as I read about Julie at button button’s August sampler featuring french knots, I knew I would have to join in. 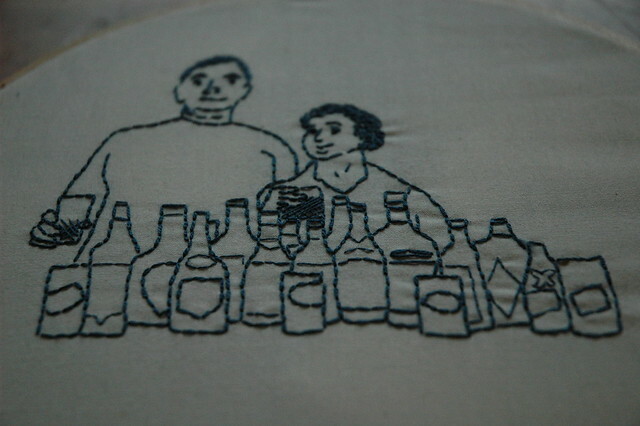 We had a decent vacation planned (that involved a long car ride) and I knew I’d probably have some time to do some embroidery, and I knew I wanted a project that was pretty portable (and well-defined). While on vacation and in the car, I did about two sections of the sampler (the yellow and the red). But what’s really helped is putting the piece in my embroidery stand. Once I did that, the progress has really picked up. What also helped was picking a sturdy needle. I tried my smaller, thinner needles (they are 9s I think) to start and that was not a good choice at all. I bent about four of them on the red section alone. 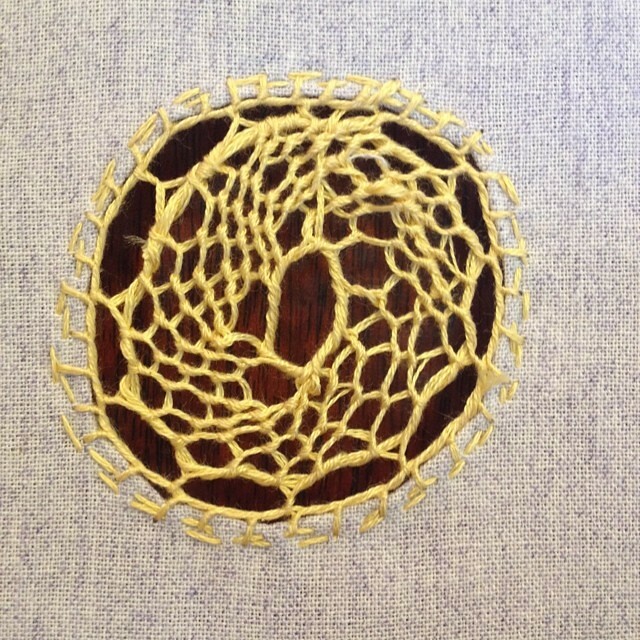 The yellow section used three strands of floss in one shade of yellow, and then I went back with one strand in a slightly lighter shade. 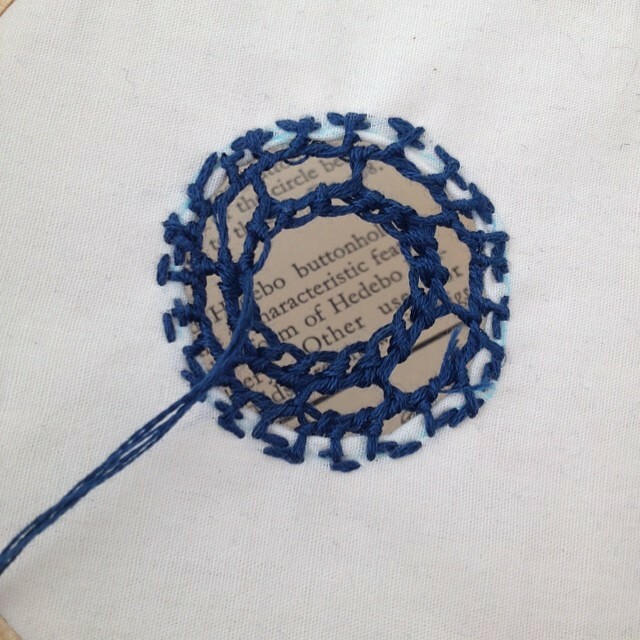 I ended up slightly bending the needle by the end. The red section uses three strands of red and one strand of pink and the amount of pulling to get the floss through the muslin is what did in the majority of my needles. Switching (and I don’t know what size needle it is, but maybe a 7?) really made my life easier. 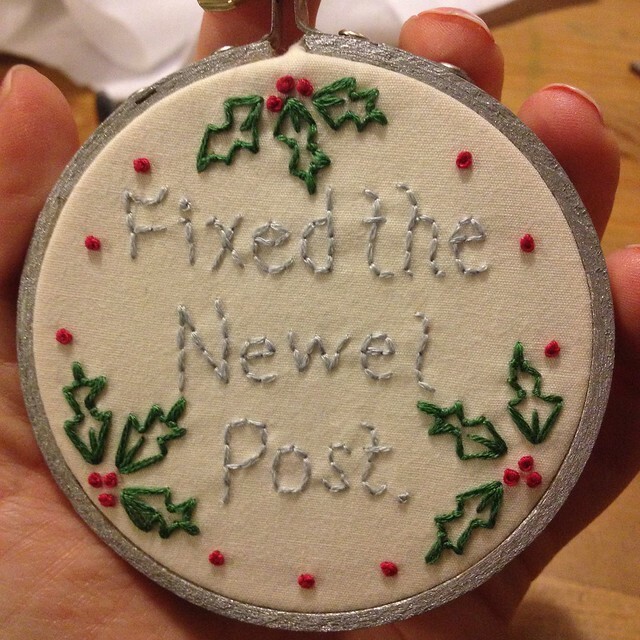 I haven’t bent this needle yet. I’m not sure that I’ll get done before the end of the month, but I am definitely going to try! I’m pretty much winging it — picking colors as I go along, and hoping that it all works out. 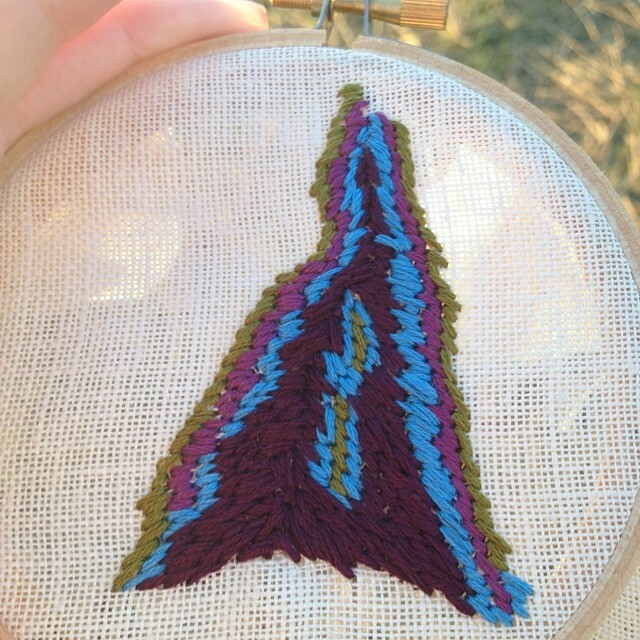 (You’ll notice a slight color change in the purple section — I ran out of floss in the shade I was using and had to move to another one that was closeish to it. I don’t mind, I like being relaxed about this process.) 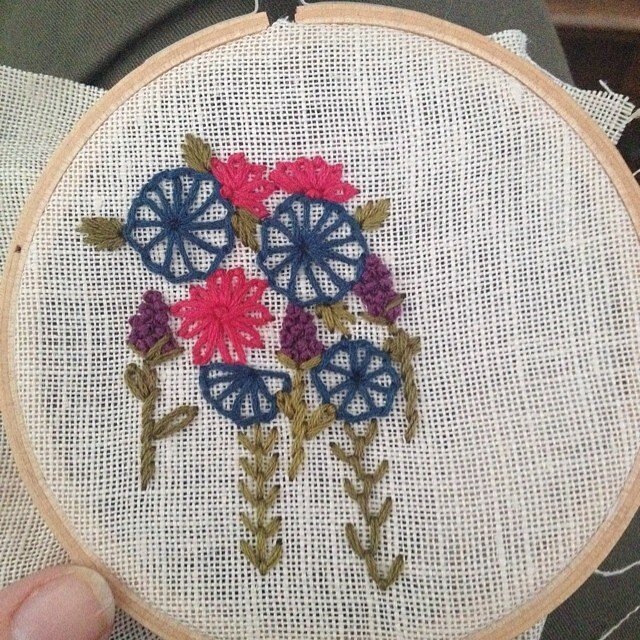 I love making french knots. And I love doing it over and over and over again. It’s been really soothing to come home to this project and work on a section. I don’t have to think too much about it, I don’t have to worry about ripping a one of a kind piece of vintage paper and working on it lets my brain (which has been working overtime) chill out.